The U-11 girls team. Front row: Madison Packish, Clare Mone, Catherine Langley, Jocelyn Baliunas, Paige Malowski, Genevieve Hyland, Paige Anderson. Back row: Caroline Jane Walsh, Maggie Best, Marin Gillis, Lora Nikolova, Wadeline Hall, Josie Welch, Hanna Hoff, and Grace Robinson. Not pictured: Elena Giordano, Caroline Bettencourt, and Annabel Eddy. Seven M.V. United travel teams took to the pitch last weekend, with three teams playing at home and the other five on the road. 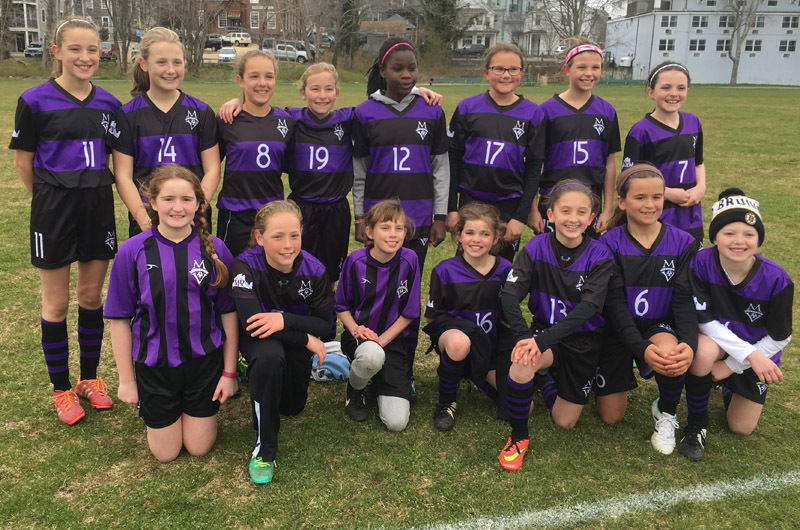 The U-11 girls team beat Norton 4-2 in their home opener Saturday at Veterans Field. Goals were scored by Clare Mone, Wadeline Hall and Paige Malowski, who had two. The U-13 boys tied 1-1 with Dartmouth, but the score did not reflect the effort on the field. After giving up an early goal, the boys continually pressured the other team. With three minutes left in the game, Simon Desouza had a goal and tied the score. The U-14 boys traveled to Seekonk for their second game of the season. They wasted no time in controlling the ball and finished the match with a 4-0 victory. Joshua Sampaio scored two goals, along with one each from Emanuel Silva and Adam Knight. The U-18 boys traveled to Freetown Lakeville for their match. With five minutes left in the game, Silas Berlin gave the Vineyard the goal they needed to secure the victory, 1-0. In a touching show of support, the U-18 girls wore number 10 for a teammate who was injured in a car accident last week. They played a well-balanced game and finished with a 2-1 victory over Falmouth. Meghan Sawyer stepped in to fill the keeper position while Adelaide Keene and Evelyn Medeiros scored for the girls. The U-10 boys defeated Freetown Lakeville 10-3. The U-14 girls played a strong game but came away with a loss to Dennis-Yarmouth 2-0. Teams have this weekend off as school vacation begins. All eight teams will return to the pitch the weekend of April 23 and 24. The M.V. United recreational season begins on Monday, April 25. More than 250 kids are ready to take the field at the West Tisbury School. M.V United looks forward to a great season. For more information, visit mvunited.org. Following the kids from down here while I travel to Orlando to watch the Orlando Pride. Be nice if the girls could come down and watch the Pride in the Citrus Bowl. With A. Morgan who just joined the team. MV United and the New England Revolution Development Academy will offer a free program this fall.